INCOMING PBA commissioner Chito Narvasa bared his first order of business is to look into league officiating, something that has been a source of controversy in past years. 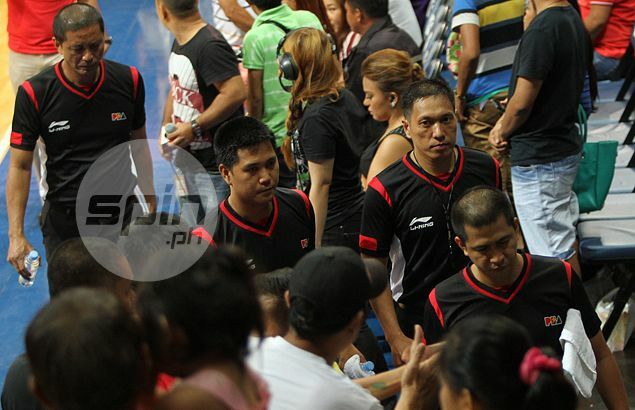 Narvasa was part of the crowd during Sunday’s double header at the Ynares Sports Arena in Antipolo as he started to observe the quality of officiating long before he assumes office starting next season. “One of the biggest problems, they keep on telling me right now, which I still have to confirm, is officiating. That’s the first thing,” the former PBA coach said in a very firm voice. The outspoken Basketball Coaches of the Association of the Philippines (BCAP) president also revealed he is paying extra attention to the complaints of teams, especially the losing ones, on calls by the referees. “Yes, aware na tayo dyan. Sanay na tayo dyan na kapag natalo ang sinisisi referee. Eh papano? Pwede ba naman na laging sisisihin referee?” he said. “I think 'yon ang difference ko sa ano eh (other candidates), naging player ako, naging coach ako,” he said, adding he was never known to complain a lot to referees during his time as coach of Purefoods and Shell. Narvasa shared he was assessed just two technical fouls for excessive complaining in his entire coaching career. “Twice lang ako nabigyan ng technical. 'Yung isa nakalimutan ko na pero yung una after I complained (about) 'yung goal tending na hindi tinawag ni (former referee) Bai Ledesma sa amin,” he recalled. “I don’t think I ever had a run-in with any of the officials,” added the son of former chief justice Andres Narvasa. Asked about his initial assessment of league officiating, Narvasa said: “Sa akin okay naman pero sabi ko nga I still have to monitor it closely. I still have to do a lot of studying and I still have to do a lot of comparing with coaches and players." Narvasa bared that he will also review tapes of controversial games for him to have a better understanding of what is the bone of contention among teams, coaches, players and even fans. “Yes I will review those. I have to find out ano ang basis. First I was asking for the rulebook. I want to understand the rules first of the PBA, afterwards I study that and I have to go to the games and find out if they are implemented and how they are implemented,” he said. Asked if he expects a hard time regulating the league officials, Narvasa sounded hardly fazed. “I don’t think so. I think it’s a matter of just talking with the stakeholders and explaining. Pero the problem here also is we need to train the referees and put everybody on the same page. That’s the challenge,” he said. And with the voices of league fans now better heard in the digital age, Narvasa vowed to judge issues solely on merit and not on the opinion of fans. “No, in any decision making you have to base it on merits, you have the video to help you. The way it is, I will base it on that,” he said. “Nung nagco-coach nga ako alam ko na kung may sampung libo na fans sa venue, sampung libo ang coach dun." And will he be a very strict commissioner? “I still don’t know. Let’s wait and see. I don’t know the atmosphere there. Bago ako, kailangan ako muna makisama,” he said, adding he plans to seek more guidance and mentorship from current commissioner and incoming CEO Chito Salud.